The PlaneWave CDK700 is a 0.7m fully automated observatory Alt-Az class telescope system for serious research. PlaneWave are combining the revolutionary optical system that founded PlaneWave Instruments with a brand new innovative alt/az mount technology that sets a new standard for small professional observatory telescopes. In the image above, are two simulations showing the CDK700’s stunning optical performance.The left column is a spot diagram and the right column is a diffraction simulation. In both of the simulations the small squares are 9x9 microns, about the size of a typical CCD pixel. In the spot diagram 21mm off-axis the spot size is an incredible 4.4 microns RMS diameter. 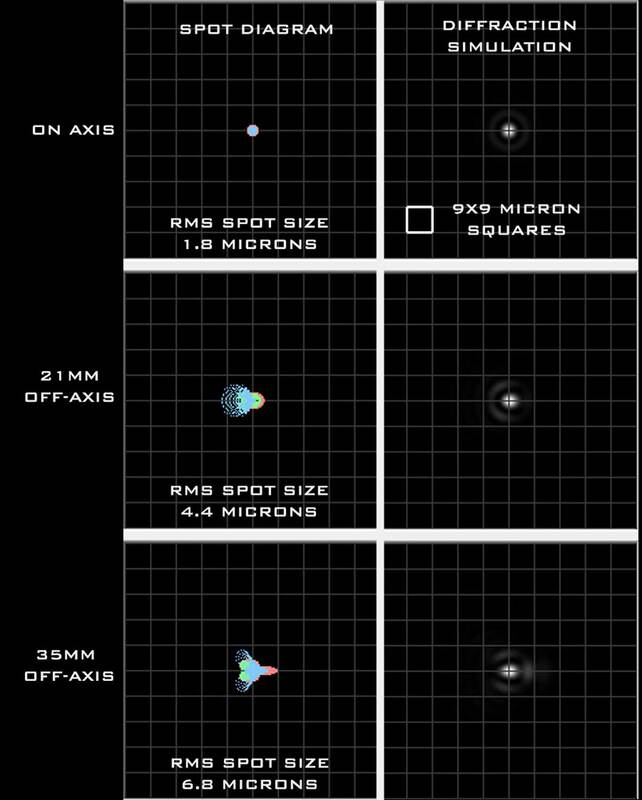 For 35mm off-axis, a 70mm image circle, the RMS spot size is 6.8microns. Both of the simulations take into consideration a flat field, which is a more accurate representation of how the optics would perform on a flat CCD camera chip. The Nasmyth focus position is on the altitude axis which means that there is virtually no balancing issue when you add or change equipment (e.g. eyepieces or CCD camera/filter wheel etc). Furthermore, if the telescope is used visually, the eyepieces remain at a constant, and wheelchair-accessible, height. This simplifying access to the telescope for public observatory events. Nasymth focus position showing a Televue eyepiece for visual observing. Inside the telescope OTA, there is a rotating tertiary mirror that allows you to switch from one Nasmyth port to the other in just seconds, allowing observers to switch between eyepieces or imagers to easily transition between different imaging equipment. Internal Tertiary Mirror for Nasymth focus switching. The PlaneWave direct drive motors mean that there are no gears to cause backlash and/or periodic error. With high-resolution encoders on both axes providing the feedback for the direct drive motors, not only will the telescope track without periodic error or have any backlash at all, but the mount will be able to counter against any wind gusts. The direct drive motors can move the telescope at incredible speeds for tracking satellites or just to minimise target acquisition time.